Spain’s justice ministry has ordered more than 600 municipalities across the country to remove symbols honouring the dictatorship of Francisco Franco which are still on display in public spaces. 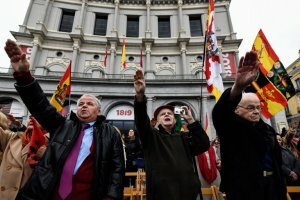 A so-called Historical Memory law approved in 2007 requires the removal of all remaining Franco symbols such as street names bearing the name of Franco generals and statues from public spaces. Some exceptions are allowed for works of particular religious or artistic significance. But according to national statistics institute INE there are still 1,171 streets and squares across Spain named after Franco-era government figures, the justice ministry said in a statement. The managing director of the justice ministry’s Historical Memory department has written to all 656 municipalities which still have Franco-era symbols to demand the ‘immediate withdrawal of shields, emblems, panels and other objects’ which commemorate the dictatorship, the statement added. Since he came to power in June, Socialist Prime Minister Pedro Sánchez has made rehabilitating the memory of the hundreds of thousands of Republican victims of Spain’s 1936-39 civil war and the four decades of dictatorship that followed under Franco, who died in 1975. The centrepiece of this effort is his government’s plans to exhume Franco’s remains from a vast mausoleum drilled into the side of a mountain at the Valley of the Fallen near Madrid to a more discreet spot. Franco, whose Nationalist forces defeated the Republicans in the war, dedicated the site to ‘all the fallen’ of the conflict in an attempt at reconciliation. But only two graves are marked – those of Franco and Jose Antonio Primo de Rivera, the founder of the far-right Falangist party which supported Franco. Franco’s relatives are fighting the planned exhumation in the courts. The 2007 ‘Historical Memory’ law, which was approved by a previous Socialist (PSOE) administration, is aimed at giving greater recognition to victims on both sides of the civil war, which was triggered by Franco’s rebellion against an elected Republican government. But the conservative People’s Party (PP) cut funding for its implementation when it came to power in 2011. The PP and other conservative parties argue the law unnecessarily digs up wounds of the past.